I am sure that you don't need a blog post to tell you that drinking and driving is an all around terrible idea no matter what country you live in. However, during these festival holiday times, many people may be tempted to try and test their luck after having a nip or two at the office holiday party. 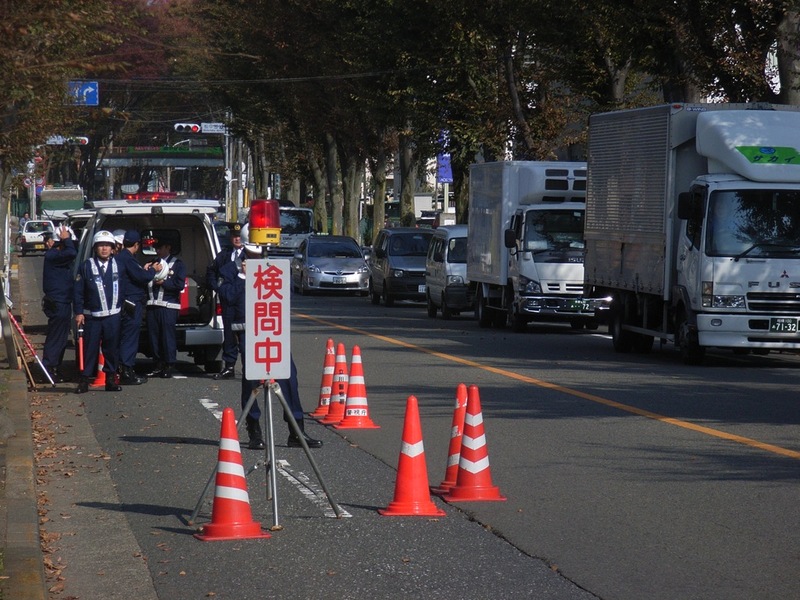 However, before you decide to tempt fate keep in mind that the Japanese police are on their game when it comes to looking for drunk drivers on the road. As you may have heard, Japan has a zero tolerance policy for drunk driving (inshu unten 飲酒運転, legally separated into two charges: shuki obi unten 酒気帯び運転 and sake yoi unten 酒酔い運転). Even if you are not technically "drunk driving" (which is hard considering the 0.03% blood alcohol limit), simply driving with the sent of alcohol on your person is enough to get your licence suspended or revoked, not to mention potential civil and criminal charges. 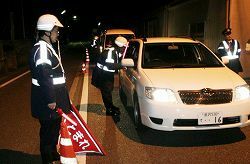 Employers can also axe you if you get caught drinking and driving since it falls under the broad category of "anti-social actions" (han-shakai kodo 反社会行動) stipulated in most work contracts. In Japan, drunk driving also includes driving while hung over, as the hangover implies an impaired ability to operate your vehicle. So don't hop in the car the morning after that big office bash. Also, keep in mind that you can be held responsible for willing let a drunk or tipsy person drive even if you are not the one driving. Also, serving drinks or lending your car to someone who gets picked up for drunk driving later in the evening can bring the long arm of the law down on your head. Kenmon (検問) literally means "checkpoint." This can refer to just about any type of checkpoint, be it military, police, or otherwise. However, in common speech the word usually refers to drunk driving inspection points set up by the local police. Kenmon tend to be most prevalent during the winter holidays due to the tradition of big alcohol drenched "forget-the-year" parties (bonenkai 忘年会) and New Year parties (shinnenkai 新年会) hosted by workplaces and individuals alike. Not surprisingly, big cities with large, concentrated bar districts tend to be prime candidates for kenmon stops. Police usually like to set up shop on large throughways right out side of the bar district, even if it means closing down a whole road and backing up traffic. However, even rural villages will have the occasion checkpoint set up. Kenmon differ from area to area but usuaully it involves cordoning off a road with cones and flashing lights. The ones that I have personally seen involve a small army of offices, waving flags and holding lighted battons. However, in more rural areas there may only be two or three officers. Just in case you couldn't guess by all the cop cars and lights, there will usually be warning signs that read 検問中 (kenmon-chu). Rounding a corner only to greeted by a bunch of police and patty wagons with flash red lights can be a bit intimidating, but just remember to keep your cool and obey all instructions. Sometimes kenmon officers will check every car, while other times they will just pick cars at random. Having an out-of-prefecture license plate is a good way to get picked out. That or being obviously not Japanese. The usual procedure involves waiting in a line of cars. An officer will signal you to pull forward one-by-one and if you are required to stop he will usually wave a big red flag. At this point you should be opening your window. What happens next seems to vary from stop to stop, but usually one unlucky officer will ask you to breathe into his face ("fuite kudasai" 吹いてください) . Sometimes you might get a pen light shined into your eyes to check your pupils. The officer may also shine a light into your passenger seat and back seats to check for suspicious objects. If it is a small checkpoint, you may be asked to show your driver's license as well. Remember, even though the kenmon is ostensibly for catching drunk drivers, you can also get nabbed for other infractions, like not wearing a seat belt. So long as nothing is out of order, the whole process takes a few seconds and you can be on your way. However, if the officer smells or sees something suspicious then he will flag you over to the patty wagon area for further checks and interrogation. You might even have to submit to a blood alcohol or breathalizer check on the spot. If it gets to this point you might want to start thinking about a lawyer. If you are worried about running into a kenmon, you can head over to K-Net and check out the user updated information about the latest traffic stops. 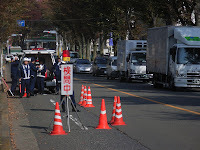 This also includes speed traps (nezumi keisatsu ネズミ警察) in addition to drunk driving checks. However, this site does not have real time information, rather just a fancy message board portal. Plus, you shouldn't be drinking and driving in the first place so don't try and use it as way to improve your odds of getting home without getting caught. If you are nabbed for intoxication, you will lose your license, and depending on your past driving history, you'll have a year or more to wait before you can get it back.